*Featured as the top article in the home page at Financial Ops, and received more than 500 views the first day it was published. 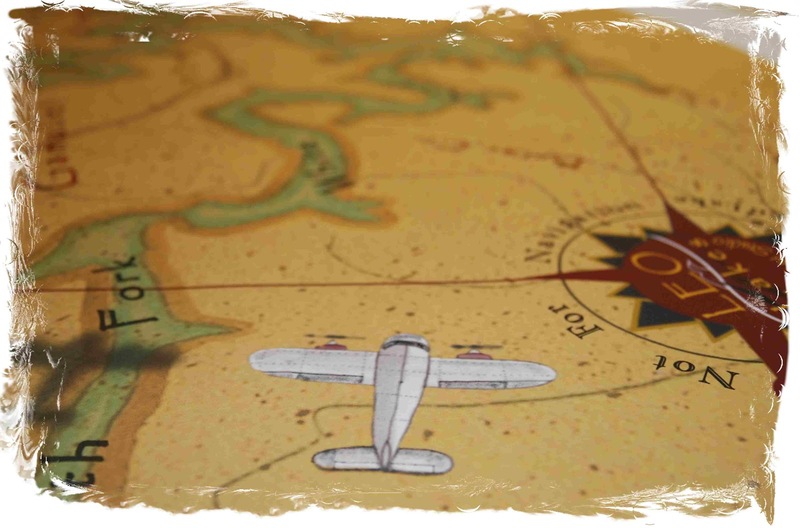 American aviator Charles Lindbergh once said, “Life is like a landscape. You live in the midst of it, but can describe it only from the vantage point of distance.” This is why every year Robert Half publishes its Salary Guide, and why businesses from all over the country anxiously wait for a peek of the year’s salary projections, as well as hiring and employment trends. According to Robert Half’s 2014 Salary Guide, U.S. salaries for professional occupations are projected to increase an average of 3.7 percent next year, with accounting and finance professionals seeing slightly less of an increase at an average of 3.4 percent. Canadian salaries in accounting and finance are expected to increase 3.2 percent. “The annual salary information from Robert Half is designed to provide businesses with the latest compensation trends, as well as advice for attracting and retaining top performers,” Paul McDonald, Robert Half senior executive director, said in a press release. The 2014 Salary Guide examines hiring and compensation trends in accounting and finance, with insights on corporate and public accounting, financial services, and the healthcare industry, featuring starting salary projections for more than 350 positions in the United States and 145 in Canada. As hiring habits change and the accounting and finance landscape continues to evolve, adjusting to new habits can leave both employers and employees tipping scales, leveraging the odds, and weighing in the necessary skills in order to optimize overall performance to compete in the market. Whether it is employers seeking to retain or hire top-performing employees, or employees trying to acquire the skills necessary to navigate the changing topography in the accounting and finance 2014 forecast, the effort should be mutual. Companies can best help professionals working in accounts payable and accounts receivable by supporting continuing professional education opportunities, says Josh Warborg, district president at Robert Half. For employees, this signifies strict preparation where candidates with the additional in-demand skills do receive more job offers more quickly and better opportunities for higher salaries. “For individuals in accounts payable and accounts receivable, they should constantly be learning and developing — more analytical skills, general ledger experience, month-end close experience, and systems experience,” Warborg says. Other in-demand credentials for employees are soft skills, especially verbal and written communication abilities and strong business acumen. “As accounting and finance professionals continue to expand their responsibilities well beyond crunching numbers, they are informing key decisions and serving as business partners across multiple departments,” the report says. Companies are increasingly turning to their accounting departments to be more than just data entry clerks. “Rather, they are looking for people who can provide insights into numbers and analysis used to make decisions,” Warborg says. The report also outlines some salaries and the growth expected in Canada. For example, AP/AR supervisors will see an average increase of 4 percent, from $51,750 to $67,500 in 2013 to $53,000 to $71,000 in 2014. When it comes to demand, Warborg says AP and AR professionals are solicited in industries including, but not limited to, consumer packaged goods, Internet software, software-as-a-service (SaaS), construction, and real estate. 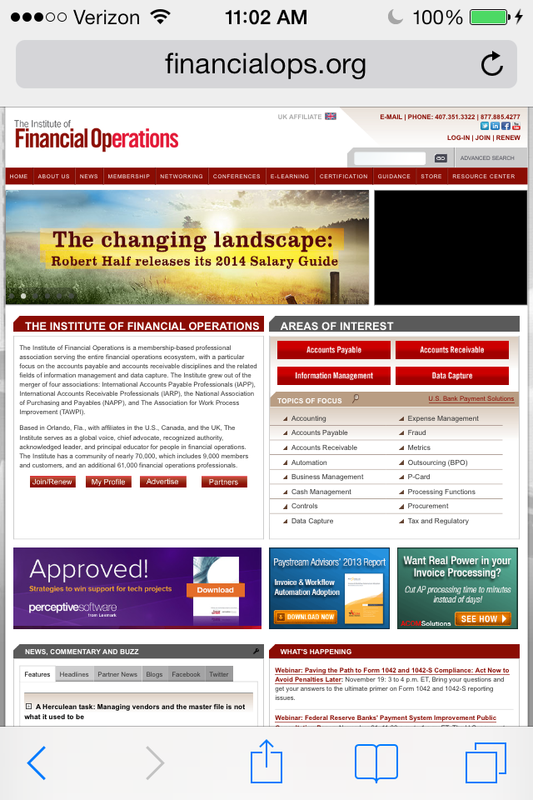 It was featured as the top article at Financial Ops and received over 500 views in just one day. Whether you want to automate all of your financial processes or simply offer both customers and employees better solutions and a clear path for growth and development, technology will be a part of your business model. Having employees who are familiar with emerging and sophisticated systems will prove a valuable asset — from analytical tools and software packages to enterprise resource planning (ERP) and cloud-computing technologies. Big data is driving the need for enhanced technology skills. “Now that there’s so much data, companies need financial professionals who are able to interpret the data, take all those volumes of data, and tell the story behind the information” Warborg says. According to the Robert Half website chart on Financial Positions in Demand for the 2014, the top two jobs that organizations are looking to fill are for senior and staff accountants. The study also indicates a significant trend in the steady demand for interim professionals, degreed candidates, and a strengthening market for internal auditors and entry-level accountants. Regionally, in the United States, accounts payable professionals are more in demand in the coming year in the New England, West North Central, and Mountain areas. In Canada, controllers are in demand in every province. 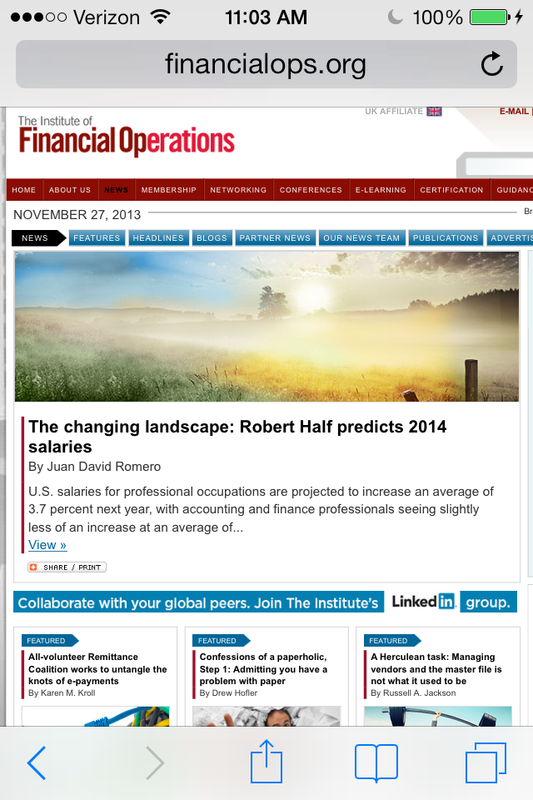 To view the chart, visit:www.roberthalf.com/finance/regional-salary-trends. Though the recession left unemployment sky-high and the hiring landscape hostile, drying out talent at the senior and management levels at public accounting firms, according to the study, unemployment rates for a number of accounting and finance occupations are actually below the national average. To view this article at Financial Ops click Here. Living life as a Gay Persian.